MONMOUTH — History is going to be made today at United West Elementary School. Kindergarten teacher Emily Higbee and her students will be Skyping with the White House — the first time this has ever been done. “We are going to be the first in the nation to have distance learning with the White House,” Higbee said. The White House and surrounding grounds constitute a national park, which will be the focus of the lesson. Higbee has made sure her students are quite familiar with the likes of Theodore Roosevelt, the 26th president of the United States who is an icon in the National Park Service. Higbee said that after the Skyping today, her students will receive an official Junior Ranger certificate. President’s Park includes the White House, a visitor center, Lafayette Park and President’s Park South, commonly known as the Ellipse, as well as the White House Gardens. President’s Park served for several years after the War of 1812 as a construction station for the reconstruction of the White House. United Technology Coordinator Trish Bertelsen also played a key role in making this happen, acquiring picture books for the students in Higbee’s classroom to help familiarize them even more with pictures of the White House. And for the alphabet, Higbee said she has tied it in with her students. For example, for the letter “s” she said it stands for Statue of Liberty. “I’m excited for them to experience everything they are learning in the classroom,” Higbee said. Higbee, in her fifth year as a teacher at United West, said she grew up going to national parks as a kid with her family. So, the kids in her classroom were able to make homemade passports. Another unique thing that Higbee has implemented into her teaching is “table talk.” It can be at home over dinner or in their car with their parents. So tonight, when the kindergarten students get home from school, they could have some very interesting “table talk” with their families. Higbee and her students will also be going to Starved Rock State Park on May 24. That will be their Stewardship Project. They were one of the winners of the Kids to Parks Day National School Contest. The National Park Trust (NPT) provided them with a scholarship to help make it happen. They were given a classroom Buddy Bison and Buddy Bison T-shirts to wear on that day. Washington, DC (April 16, 2019) – National Park Trust (NPT) is pleased to announce that Chelsea Vines, a 3rd-grade teacher from M. Agnes Jones Elementary School in Atlanta, GA, has been selected as NPT’s Youth Programs Fellow. As a two-year fellow, Ms. Vines will serve as an education advisor to the NPT Board of Trustees as a member of the board’s youth programs committee. She will also participate in board meetings including an annual fall meeting in a national park. 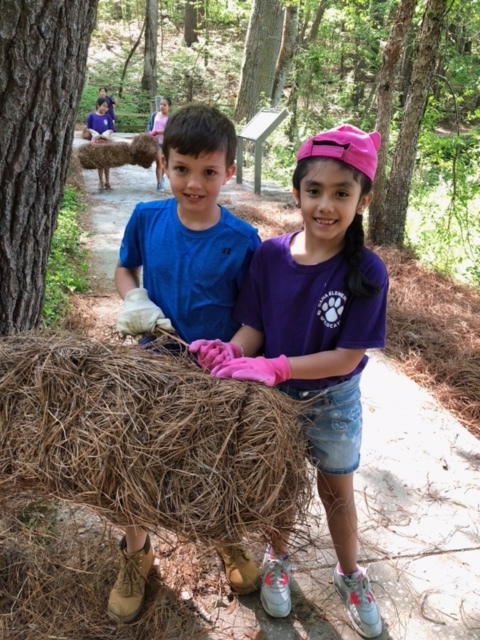 NPT has worked closely with Ms. Vines since 2014, when M. Agnes Jones was welcomed into its national Buddy Bison School Program to provide outdoor environmental education for their 3rd grade students—thanks to a multi-year sponsorship from the Georgia-Pacific Foundation. Prior to becoming a teacher, Ms. Vines was a financial services manager for a major Fortune 500 corporation in Atlanta; however in 2005 she decided to leave the corporate world in search of something more personally fulfilling. She was selected as a 2006 Teach for America Corps Member and upon completion of their rigorous summer institute, she was placed as a 1st-grade teacher at M. Agnes Jones Elementary, a Title I school in downtown Atlanta where over 98% of the students receive free or reduced-price lunch. Over the years, while she has changed grade levels within the school, she has always been passionate about providing new enriching opportunities for her students. Because of the support from the Georgia-Pacific Foundation, Ms. Vines has been able to incorporate environmental education, outdoor recreation, and stewardship—the 3 pillars of the Buddy Bison School Program—into every aspect of her classroom. She was integral in securing STEM accreditation for her school as part of a committee of teachers who worked to inspire others by incorporating STEM lessons across the curriculum. Thanks to the efforts of that committee, M. Agnes Jones was the first school in Atlanta to receive full STEM accreditation, and most recently STEAM, accreditation. 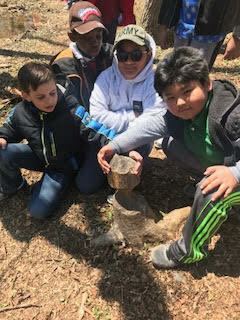 Because of her extraordinary efforts to connect her students with the benefits of the great outdoors, Ms. Vines was also the recipient of NPT’s 2018 National Educator Award for Outstanding Environmental Stewardship. The results are in, and the winners of the Kids to Parks Day National School Contest 2019 have been announced! We received an incredible number of wonderful contest entries. A huge Buddy Bison thanks to the students and teachers for all their hard work. We loved their videos, letters, and artwork received too! Congratulations to the 68 winning schools and their nearly 4,000 students that will be exploring parks this May for Kids to Parks Day. From grades Pre-K through 12, these students represent 25 states, plus Washington, D.C. and Puerto Rico! In addition to having a park adventure, they will be giving back to the parks too – from trash pick-up to water testing to tree-planting projects. We can’t wait to see all of their pictures and stories from the day. Thank you to our sponsors Hydro Flask and the First Solar Corporate Charitable Fund of the Toledo Community Foundation for their generous support for this contest. Because of their donations, 44 schools will also receive Buddy Bison t-shirts, while another 10 will have Hydro Flask water bottles to take on their adventures. While you’re on the website, you’ll see that there’s not just a contest, but events all over the country for Kids to Parks Day that you can attend! Remember to register and be counted! There are plenty of outdoor adventures to be had in winter, but sometimes you just want to stay inside and keep warm. Thankfully, plenty of parks offer programs you can host right inside your classroom! Baltimore schools Wolfe Street Academy and Frederick Elementary enjoyed a visit from Maryland State Parks’ “Scales and Tales” program. Naturalists brought several “animal ambassadors” to meet the preK through third grade students. With the help of owls, turtles, and even snakes, the naturalists taught the students that all wildlife has a purpose in nature and in their own lives. Third grade teacher Liz Bucke at Wolfe Street Academy said, “The program was so engaging, [the students] are still talking about it and were making connections about the animals to our reading lesson today! Another one of our partners, Earth Conservation Corps (ECC), brought their falconers and raptors to Neval Thomas Elementary’s 3rd grade in Washington, D.C (a falconer is a certified professional who trains and cares for birds of prey). Just like with Maryland State Parks’ ‘ambassadors,’ these birds showed kids just how amazing nature can be. ECC also visited students at Beacon Heights Elementary and Patterson Elementary. A big thank you to Bunting Foundation, Pepco, DecisionPoint, and MCS, Inc. for making these unforgettable programs possible for these students! Did you know that the White House is a national park? Its other name is “President’s Park.” Cesar Chavez Elementary from Hyattsville, Maryland not only visited this park, but received an all-star tour inside the White House itself. Because the White House is a very important residence AND the seat of the Executive Branch of the United States, there’s a lot of tight security! Before they even could get into the Visitor Center, the students and teachers had to send the White House their personal information, and walk through a metal detector. Once inside, they searched the Visitor Center exhibits for examples of how the White House is an office, a house, and a museum, all rolled into one. Secret Service Officer Bagwell answers students questions during their White House tour. Then they had to go through two MORE security checkpoints before they split into smaller groups to tour the actual White House itself with a ranger. The students learned the history of each of the rooms and all the important things that have happened here. They counted how many eagles are worked into the decorations in the State Dining Room (ten). Plus, there was Secret Service all over, and the students were encouraged to ask them questions. When in the big East Room, student Jairo (center, checkered hat) asked Officer Bagwell what had survived the White House fire (in 1814). The answer? The portrait of George Washington, pictured with Buddy Bison below! Afterwards, the kids put the White House into the context of the rest of Washington, D.C. They discovered how the city had changed over time by studying maps and exploring the nearby historic Lockkeeper’s House. Did you know that a canal used to flow right alongside the National Mall in the 1700s? The lock keeper who lived in this house collected tolls and operated the lock of the Washington City Canal. 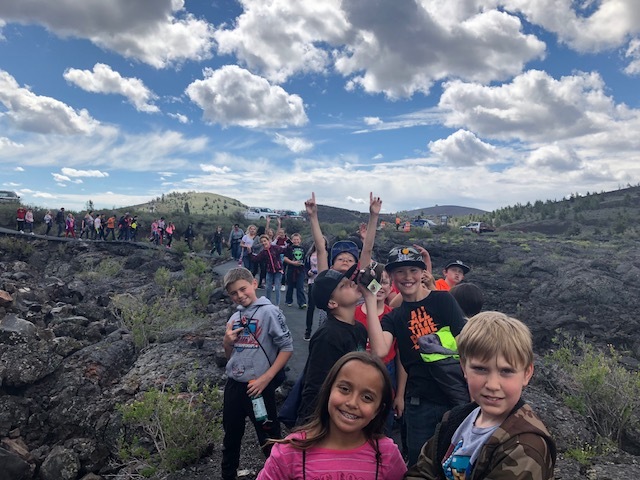 These fourth graders were able to enjoy this park adventure thanks to funding from the National Park Foundation and the Every Kid Outdoors program. For the next seven years, this program will allow any fourth grader to visit any national park for free, all because of an act recently approved by Congress. Are you in fourth grade, or know someone who is? Then head over to EveryKidInAPark.gov and learn how to get your own free park pass! Have you ever wondered if you would be able to build a fire or a shelter to keep yourself warm in the wilderness? Or if you would be able to find your way without using your phone? Buddy Bison Student Ambassador Sarah put her wilderness skills to the test this winter. Find out what she learned! National Park Trust is pleased to announce the winners of our 2019 Kids to Parks Day School Contest! The school contest is a national program providing up to $1,000 to Title I schools to cover transportation costs, program and stewardship project fees, and educational materials to encourage outdoor education, recreation, and stewardship. This year, 67 schools were selected to receive funding that will support over 4,000 students from grades pre-K through 12. The selected schools represent 25 states plus Washington, DC and Puerto Rico. Thank you to our sponsors, The First Solar Corporate Charitable Fund and Hydro Flask, whose gift will fund many of these park experiences. For more information about the contest, contact Katie Zimmerman at katie@parktrust.org or call 301-279-7275. Rockville, MD (February 21, 2018) – National Park Trust (NPT) is pleased to announce that it has received renewed funding from the First Solar Corporate Charitable Fund of the Toledo Community Foundation in support of the Kids to Parks Day National School Contest. The First Solar Corporate Charitable Fund has had a long term partnership with NPT dating back to 2012. With the $25,000 gift from First Solar, National Park Trust will be able to support 25 Title I schools through their Kids to Parks Day National School Contest. For many of these students, this will be their first park experience. The Kids to Parks Day Contest is a national program providing up to $1,000 per school to cover transportation costs, program and stewardship project fees School bus funding is the biggest barrier to the outdoors for students in Title I schools. This year’s contest closed on February 14th and is open each year to Pre K through 12th graders that attend Title I schools, the federal indicator of low-income schools. Each year, using their grants, the students discover a local park where they enjoy outdoor recreation, use the park as an outdoor science or history classroom, and learn about their role as park stewards by participating in service projects. “On behalf of the thousands of students from Title I schools that benefit from our multi-year partnership, we are very grateful for this renewed generous gift from the First Solar Corporate Charitable Fund of the Toledo Community Foundation. Each year, these students look forward to discovering and exploring new parks in celebration of Kids to Parks Day,” stated Grace Lee, Executive Director, National Park Trust. COMMUNITY FOUNDATION Toledo Community Foundation, Inc. is a public charitable organization created by citizens of our community to enrich the quality of life for individuals and families in our area. In existence since 1973, the Foundation has more than 800 funds with assets of approximately $287 million. The Foundation provides philanthropic services for individuals, families, businesses, and corporations to meet their charitable giving needs. For more information on the Foundation, visit the organization’s website at www.toledocf.org or follow them on Facebook. We are thrilled to hear that the President has signed the John D. Dingell, Jr. Conservation, Management, and Recreation Act (S. 47) into law! The law permanently reauthorizes the Land and Water Conservation Fund (LWCF) and the Every Kid Outdoors Act (formerly the Every Kid in a Park program) for seven years. Collectively this legislation, originally known as the Natural Resource Management Act, will benefit thousands of parks, public lands, and waters as well as providing access to the outdoors to millions of 4th graders and their families. The Land and Water Conservation Fund is America’s most important conservation program, responsible for protecting parks, wildlife refuges, and recreation areas at the federal, state, and local levels. Many of the lands that NPT has transferred to the National Park Service were purchased with funding from LWCF, including Rocky Mountain National Park, Washita Battlefield National Historic Site, Glacier National Park, Appalachian National Scenic Trail, Kennesaw Mountain National Battlefield Park, and Zion National Park. The Every Kid Outdoors Act will greatly support our youth program initiatives by providing all 4th graders with a park pass that gives them access to America’s public lands and waters. One third of our Buddy Bison School Program students and their families have benefited from this program. Will you help NPT complete more parks and give park ecosystems and species a better chance at survival by making a gift today? NPT is part of the Land and Water Conservation Fund Coalition, take a look at their press release about the bill. Read an op-ed by NPT Board Member, Richard Ring, on how the LWCF supports the outdoor economy. National Park Trust and Wreaths Across America (WAA) worked together this year to teach a new generation the importance of our nation’s memorials. Students from West Education Campus (DC) assisted Gold and Blue Star families with laying 140 wreaths on the Vietnam Veterans Memorial on Friday, December 14, 2018. In the process, students formed emotional connections with the families they helped, understanding their loss, and learning their stories. Based in Maine, Wreaths Across America’s mission is to “Remember – Honor – Teach”. Buddy Bison Students learned about the WAA mission and our memorials prior to the moving ceremony, but none of them anticipated how much more they would learn by meeting the families of our fallen soldiers. Anderson, a 5th grader from West Education Campus (DC) speaks with a Vietnam Veteran. “It was so powerful. We told the students what they would be doing and why it was important, but as they spoke with the families and joined them in saluting the engraved names, it really impacted the students. I couldn’t have taught them the emotion they felt first hand,” stated Heimy Salgado, teacher at West Education Campus. Gabriel, a 4th grader from West Education Campus (DC) salutes the memorial with a Gold Star father. One wreath was laid at each of the 140 panels of the Vietnam Veterans Memorial by a Gold or Blue Star family member along with a student and a Maine Sheriffs Association officer (the Maine Sheriffs Association has worked with WAA since they began bringing wreaths to Washington, DC). The slow procession of the wreath-layings allowed time for each family to share stories about their loved ones honored at the memorial, and for their name to be read allowed and saluted by the Maine Sheriffs. One student, Carl, asked the Maine Sheriff officer what was the meaning behind this gesture. She graciously explained that is was a sign of respect then showed him step-by-step how to properly salute. After the event, many students went home to research the names they had read, learning about who they were and where they were from. They also were eager to share stories with their classmates about the families they met and the soldiers they learned about. “I was sad to see so many names on the Vietnam Memorial but I learned how each one of them sacrificed their lives for us. I won’t ever forget this experience,” said 5th grade student Talita. “I didn’t expect to connect to the family so fast. As we saluted his son’s name, I could feel what he felt. I know now the sacrifice they made,” said Gabriel, a 4th grader after laying a wreath with a Gold Star father. Carl, a 4th grader from West Education Campus (DC) learning to salute from a Maine Sheriff officer. National Park Trust and West Education Campus were honored to assist Wreaths Across America with this ceremony. Together we are teaching our children to remember the important sacrifice of our nation’s veterans and military families. For more information on this event see our press release. Buddy Bison Student Ambassador Bryan has been busy the last two years! This month, Bryan has made a list of his top 10 national parks and what he loves about them. Zion was an amazing park. I got to hike the Narrows, which was cool. It’s also great for kids because they can play in the water. The best time to go is October because there are no flash floods and the fall colors are beautiful and the water isn’t too cold. The summer gets really hot, so be prepared for the heat. Make sure to bring your gear. And look for big horn sheep and lots of mule deer. Acadia was a mixture of green mountains and beautiful beaches. I enjoyed hiking the Coastal Trail which is right next to the water and lead right to the beach. I would visit Acadia in summer so you can experience the beaches. North Cascades is one of the least visited national parks, so it is very quit. It also has amazing emerald green water caused by the minerals that come from the mountains. The best trail is the Bored Walk at Diablo Lake. You should go in spring or summer because in winter the visitor center is closed and in fall there aren’t too many fall colors. All the way out in North Dakota is a park dedicated to President Teddy Roosevelt. This park reminded me a lot like Yellowstone, but it is much less crowded. There are bison, prairie dogs, elk, wild horse, and coyotes howling. Take the Prairie Dog Town Trail and you will see hundreds of little prairie dogs running around and if you are lucky I saw a badger there! I think the winters would be harsh, so come during any other time of the year. Biscayne is a place for swimming, snorkeling, paddle boarding, and so much more. The best trail is the visitor center trial which gives you beach access and great views of downtown Miami; bring your bathing suit. Also make sure to check out the mangroves because you could see manatees. The best time to visit is any time because the weather and water is always perfect. Yellowstone is a park that if you want to see animals that’s the park to go. You can see anything from a grizzly, to bison, to a pika. I liked the Geyser Basin Trail which you get to see Old Faithful. The best time to go is fall because the colors and the wildlife encounters. Lamar Valley is a great place to view the wildlife and Mammoth Hot Springs VC there is always elk! You can plan this trip with Grand Teton. Grand Teton was stunning. I did the Jenny Lake Trail which gave you stunning views of mountains and lakes. The best time to go is fall because they have beautiful fall colors and it’s the best time to see bears. Haleakala was one of my favorites because I got to feel the clouds and see the silver sword plant which is an indigenous plant only found in Haleakala. The best trail is the Northern Visitor Center Trial because you get a viewing of the sun rise; make sure to make your reservations in advance for parking. The best time is anytime because it’s Hawaii! Take the road to Hana after your trip to this National Park. The Shadow Lake Trail was awesome it lead you right to a water fall and behind the water fall was Mount Rainier. The best time to go is summer through fall because of the nice weather and fall colors. Winter might be too cold. The Rockies are indescribable; it’s so beautiful. I would do the Bear lake and Sprague Lake Trail which in winter you can walk over the frozen lake. The best time to go is any time of the year, but I like winter because you can snowshoe, sled, backcountry ski, and so much more. The Crown of the continent is my favorite park because of the mountains, the emerald green lakes, the animals and scenery. You should do the Many Glacier Trail because of the lakes, the bears, and the glaciers; bring your bear spray. The best time to go is before winter because of the stunning colors, the best weather, and the biggest chance of seeing animals. Also, you want to visit before they close the Going-to-the-Sun Road, so check out the website before you make plans. December 12, 2018 (Washington, DC) – In advance of National Wreaths Across America Day, National Park Trust and the non-profit Wreaths Across America will host several wreath laying ceremonies on the National Mall to honor veterans and fallen service members from the Vietnam Veterans War Memorial, Korean War Memorial, and the World War II Memorial on Friday, December 14, 2018. As part of Wreaths Across America’s mission to “Remember – Honor – Teach,” forty students from National Park Trust’s Buddy Bison School Program (West Education Campus, a Washington, DC public school) will be assisting in the ceremony as they learn the importance of the memorials and the purpose behind honoring these memorials during the holiday season. The ceremonies on the National Mall are done in collaboration with the Maine Sheriffs Association. “We are pleased to be able to work with Wreaths Across America and National Park Service to educate our Buddy Bison students about the importance of remembering and honoring those who have sacrificed their lives for our nation,” stated Grace Lee, National Park Trust executive director. Speakers will include: Major General James T. Jackson, U.S. Army (Retired) Director, U.S. Vietnam War Commemoration (Vietnam War Memorial Speaker); David L. Bernhardt, United States Deputy Secretary of the Interior (WWII Memorial Speaker); Morrill & Karen Worcester, founder and executive director (respectively), Wreaths Across America; Wayne Hanson, chairman of the board of directors, Wreaths Across America. The ceremonies will begin at the Vietnam War Memorial at 1:30pm. All ceremonies will be open to the public. Coinciding with these events, the Wreaths Across America Mobile Education Exhibit will be stationed on the National Mall throughout the day (8 am – 1 pm) and open to the public. National Park Trust (NPT) is a non-profit dedicated to preserving parks today and creating park stewards for tomorrow. NPT is the only land trust with a comprehensive mission of protecting national parks through land acquisition, and creating a pipeline of future park stewards by getting kids to parks. Since 1983, NPT has completed 70 land projects in 31 states, 1 US Territory, and Washington, DC. This school year, NPT will provide an estimated 25,000 under-served kids with park trips through their nationally recognized Buddy Bison Programs and Kids to Parks Day National School Contest, both of which support Title I schools. The Maine Sheriffs’ Association (MSA) is a non-profit organization that coordinates law enforcement and corrections activities with other related agencies. It works to improve and professionalize the sheriffs’ offices in Maine and to assure that all citizens receive the highest quality law enforcement and jail services in an efficient, courteous, and humane manner. In late November, National Park Trust (NPT) received an early Christmas present: this amazing book (pictured below) from Krista Gordon in Bellingham, WA! It celebrates our partnership with her over the last few years. Who is Krista Gordon you ask? In 2014, she was working as a substitute teacher at Alderwood Elementary when she first encouraged her students to apply to NPT’s Kids to Parks (KTP) Day School Contest. They won the grant and over 40 fourth graders found inspiration in the ocean and whales at Lime Kiln Point State Park, just like Krista had! The next year, Krista secured funding for nine more under-served schools to visit the park. Her efforts won her the “The Buddy Award” for Outstanding Environmental Stewardship from NPT. Krista went on to found the Salish Sea Experience, a non-profit focused on “bringing learning to life to inspire tomorrow’s environmental stewards.” In the 5 years since that first field trip, we’ve helped support 9 trips there for 3 schools through the KTP Day National School Contest, involving over 420 students! Learn more about this incredible program by watching this video. Thank you note from a Cordata student. We hope that you find Krista Gordon’s story as inspiring as we did! If you’re interested in funding a dream park trip of your own, you too can apply for a scholarship! You can win up to $1,000 through the Kids to Parks Day National School Contest. Kindergarten through 12th grade students at all Title I Schools across the country are eligible to apply! The deadline for entries is Thursday, February 14, 2019 — that’s in just two months! Winners will be announced on NPT’s website Thursday, March 7, 2019. Click here to learn more about the contest, download the entry form, and watch our school video from last year! Questions? Contact Katie Zimmerman, (katie@parktrust.org) or call 301-279-7275. If you would like to help sponsor this program, contact Rebecca Hansell, rebecca@parktrust.org. Mullanphy ILC (MO) at the top of the world in Gateway Arch National Park. Mullanphy ILC felt on top of the world last month! They visited Gateway Arch National Park in Missouri with Buddy Bison. Students journeyed to the top of the Arch and explored the brand new museum with Ranger Chris. They discovered that St. Louis is called the “Gateway to the West” because it was where hopeful pioneers all started their journey into the Western frontier of the young United States. Plus, he gave us a lot of museum artifacts to touch, like Native American beads and a whole bison skin! They also got to meet me, Buddy Bison, and received their Every Kid in a Park passes! A special thank you to The North Face for making this day of exploration possible. 4th graders from Pennycook ES (CA) doing “belly biology” from the pier at San Francisco National Historical Park. Even in the middle of busy San Francisco, there is wildlife to be found! Annie Pennycook Elementary (CA) 4th graders discovered sea creatures in the harbor at San Francisco Maritime National Historical Park. They saw sea lions lounging, barnacles clinging, and plenty of seaweed growing in around the harbor. They didn’t just stay in the harbor though – they went inside the historic ships too with Ranger Rejane for a tour. Afterwards, they received their Every Kid in a Park passes just like Mullanphy did. A big thanks to the Bellamy Family for making this trip possible! Want your own Every Kid in a Park Pass? If you’re a current 4th grader (or know one), go to EveryKidInAPark.gov and learn how you can get one! It’s valid now until June 2019. Not only can 4th graders enter any federal public land for free with their pass, but their families can too! This month, Buddy Bison Student Ambassador Audrey Elliot shares her park adventures from her recent visit to Washington, DC and her own insider secret to visiting multiple parks in one day. Read more on Audrey’s blog. National Park Trust (NPT) is pleased to announce that it has been selected as a 2018 recipient of Hydro Flask’s ‘Parks for All’ Charitable Giving Program. Parks for All supports the development, maintenance, and accessibility of public green spaces in the US and beyond so people everywhere can live healthier, happier, and more fulfilled lives. With the $50,000 gift from Hydro Flask, National Park Trust will be able to support 50 Title I schools—impacting more than 2,200 students—through their Kids to Parks Day National School Contest. For many of these students, this will be their first park experience. The Kids to Parks Day School Contest is a national program providing up to $1,000 per school to cover transportation costs and program fees, the biggest barrier to the outdoors for students in Title I schools. This year’s contest closes on February 14th and is open to Pre K through 12th graders that attend Title I or low-income schools. In 2018, through the Kids to Parks Day National School Contest, National Park Trust provided over 100 grants benefiting 5,000 students in 35 states and the District of Columbia. Using their grants, the students discovered a local park where they enjoyed outdoor recreation, used the park as an outdoor science or history classroom,and learned about their role as park stewards by participating in service projects. “On this Giving Tuesday, we are thrilled to share that we have been awarded Parks for All funding from Hydro Flask,” said Grace Lee, executive director of National Park Trust, “with their early lead support, Hydro Flask is helping us to build an “access trail” so that many more children from under-served communities across the country can celebrate Kids to Parks Day in May. Find out more about this grant program at www.hydroflask.com or read the program press release here. Read more about the Kids to Parks Day National School Contest. National Park Trust (NPT) is a non-profit dedicated to preserving parks today and creating park stewards for tomorrow. NPT is the only land trust with a comprehensive mission of protecting national parks through land acquisition, and creating a pipeline of future park stewards by getting kids to parks. Since 1983, NPT has completed 70 land projects in 31 states, 1 US Territory, and Washington, DC. This school year, NPT will provide an estimated 25,000 under-served kids with park trips through their nationally recognized Buddy Bison School Program and Kids to Parks Day National School Contest, both of which support Title I schools. Hydro Flask is the award-winning leader in high-performance insulated products ranging from beverage and food flasks to the new Unbound Series™ soft coolers. Delivering unexpected refreshment, Hydro Flask innovations showcase TempShield™ double-wall vacuum insulation to lock in temperature, 18/8 stainless steel ensuring pure taste and durable, ergonomic design for the ultimate transport. Founded in 2009 in Bend, Oregon, Hydro Flask is committed to making tomorrow better – from using BPA-free, recyclable materials to its charitable giving program Parks For All, which supports the development, maintenance and accessibility of public green spaces so people everywhere can live healthier, happier and more fulfilled lives. Learn more about Hydro Flask, Parks for All, and their mission to save the world from lukewarm at https://www.hydroflask.com. For more information about Helen of Troy, please visit www.helenoftroy.com. Thank you note from Bianca, a Washington Grove Elementary School third grader. Speaking of Thanksgiving, I’m so thankful for students at the Bullis School (MD) who enter our Kids to Parks Day School Contest each year to help an under-served class in a nearby community. Because of the Bullis students, 50 children went on a free park field trip to Black Hills Regional Park and were able to celebrate Kids to Parks Day last May! What a wonderful idea! To tell this story, I sat down with Bullis teacher Carolyn Cohen who has been an educator for over 30 years. She told me how her third graders were motivated to help others and how everyone learned so much more than expected. “For eight years as an elementary school teacher at Bullis, I championed National Park Trust’s mission to make our local, state, and national parks accessible to children of all economic backgrounds. I saw the joy of children playing in nature, learning life skills like problem solving, cooperation, and stewardship, while getting exercise in a fun way. I learned from NPT that many children can’t get to their local parks because of the cost of transportation or entry fee. To help change this I decided to have my third grade class enter the ‘Kids to Parks Day School Contest’ on behalf of a nearby Title I school. My students researched the costs of healthy snacks by looking at food ads in the newspaper. They used math skills to stay in budget and make smart decisions based on the costs. To write the application they discussed as a group how a persuasive writing style would help them win the contest. Finally they researched local parks near the school and found that they could plan a boat trip on a lake for the lucky winners. My students were joyful as they worked hard to provide this trip for other kids who would not otherwise be able to enjoy this experience. When they learned they were one of the national winners their cheers were deafening. The other students were able to go on a field trip that showed them the habitats and ecosystems they had learned about in class. The students had a day full of healthy outdoor exercise and learning. Interested in learning more about our Kids to Parks Day School Contest? Check out the application here and be sure to apply by February 14, 2019. What’s better than visiting one park in one day? Learning about four parks in one day! Thanks to support from the National Park Foundation’s Open Outdoors for Kids funding, we are working with local national parks to host 4 park jamborees for 4th graders. At our first fall jamboree, National Park Service rangers from Kenilworth Aquatic Gardens, National Mall and Memorial Parks, and Frederick Douglass National Historic Site all came together at Bladensburg Waterfront Park (MD). Hundreds of 4th graders from Patterson Elementary, Washington Jesuit Academy, Raymond Education Campus, and Langdon Elementary joined them. They had a fun day of hands-on activities at the park. Besides learning all about history, local wildlife and their local national parks, the kids paddled down the Anacostia River with Wilderness Inquiry (MN) and their Canoemobile program. Plus, the Alice Ferguson Foundation taught them about the impact they have on their watershed! Patterson Elementary (DC) fourth graders show off their Junior Ranger badges at Bladensburg Waterfront Park (MD). The next jamboree took place at the Jefferson Memorial on the National Mall just last week. Our ranger friends from the first jamboree joined us, plus more rangers from Rock Creek Park, Mary McLeod Bethune Council House National Historic Site, and Carter G. Woodson Home National Historic Site. Fourth graders from Neval Thomas with Buddy Bison and Acting Superintendent Patricia Trap at the Jefferson Memorial (DC). Are you in 4th grade at a Title I School in DC, Montgomery County, Prince George’s County, or Northern Virginia? It’s not too late for you to join us! Talk to your teacher about signing up for a free park trip on our website. The last two jamborees will be at Rock Creek Park and Kenilworth Aquatic Gardens this spring. Hope to see you there! Buddy Bison students paddling on the Anacostia River (DC). After the jamboree in Bladensburg Waterfront Park, the Wilderness Inquiry’s Canoemobile program stayed in Washington, DC and Baltimore for almost two weeks so that our Buddy Bison kids could paddle on both the Anacostia (DC) and the Patapsco Rivers (MD). Many partners joined us for land-based learning. L.L. Bean and The North Face showed us kids how to set up a tent, the Bureau of Land Management led nature hikes, the U.S. Army Corps of Engineers talked to us about water safety, and the U.S. Forest Service played a game that showed us how trees keep water clean. Over 1,000 kids in grades 3rd through 8th from D.C. and Maryland Title I schools had fun both on water and on land. For most of them, it was their first time ever in a canoe or at the park! A huge Buddy Bison thank you to National Park Foundation, Paddle Nation, MCS Services, A. James and Alice B. Clark Foundation, Pepco, and DecisionPoint, for supporting our Buddy Bison kids—and to all of our amazing program partners who helped make these adventures possible. Great Oaks Public Charter School students discover the invertebrate life in First State National Historical Park (DE). Students from Great Oaks Public Charter School, Kuumba Academy Charter School, and the Pilot School attend the first Science Fest in First State National Historical Park. Students participated in hands-on, interactive activities that helped students understand the historic resources, cultural landscape, and diverse ecosystem in the Beaver Valley, one of the newest units of the national parks. Thank you to The North Face and their Explore Fund for sponsoring this school program. They also are sponsoring four other schools this year in St Louis (MO), Wilmington (DE), Newark (NJ), Brooklyn (NY), and Hendersonville (NC) who will explore their local national parks too! We look forward to sharing their park adventures too! Bruce Vento Elementary (MN) students at Bruce Vento Nature Sanctuary (MN). Buddy Bison 4th graders from Bruce Vento Elementary (MN) went on a very special trip this fall. They visited the Bruce Vento Nature Sanctuary (MN) for a brisk but fun morning of outdoor fun and learning. Both the school and the Nature Sanctuary are named in memory of Congressman Bruce Vento, a park champion and former school teacher. Mrs. Vento (right) and NPT board member Chad Dayton (center) pass out Buddy Bisons to Bruce F Vento Elementary (MN). During the trip, students learned about pollinators with the Minnesota GreenCorps, met a live owl with the Dodge Nature Center, and did a habitat assessment and hike with National Park Trust staff. This fun-filled morning was capped off by a surprise visit from Mrs. Sue Vento and NPT board member Chad Dayton, who presented each student with their very own Buddy Bison, their new travelling companion and a reminder to “explore outdoors, the parks are yours!” A special thanks to the Bruce Vento Science Educator Scholarship Fund for sponsoring this school and for making this day possible. Buddy Bison Student Ambassadors Audrey and Sarah at the White House Halloween Event. Buddy Bison Student Ambassador Sarah Hullihen certainly had a spook-tacular Halloween! Sarah joined fellow Student Ambassador Audrey Elliott and NPT staff at the White House Halloween event for trick-or-treating. Check out Sarah’s blog to read more about her Halloween adventure, and hear about the rest of her trip to Washington, DC. National Park Trust (NPT) is pleased to announce that 35 acres of once private land has been permanently protected from development and returned to Zion National Park. NPT worked with The Trust for Public Land and the National Park Foundation to purchase the 35 acre in-holding—a privately owned piece of land completely surrounded by the park—and donate the land to the National Park Service. The land is near Firepit Knoll, on the Kolob Terrace in the north west area of the park and is an important section of the park for hikers traveling the popular Hop Valley Trail. In protecting this area from development, visitors can continue to enjoy the natural landscape unique to Zion. NPT assisted our partners with this project by providing the final funds required for closing costs and due-diligence work on the property before it could be processed for donation to the National Park Service. This is the second project National Park Trust has completed within the same area in Zion National Park. In 2012, NPT worked with National Parks Conservation Association and The Trust for Public Land to protect a 30 acre parcel at the base of Tabernacle Dome, just four miles from the current project. National Park Trust (NPT) is a non-profit dedicated to preserving parks today and creating park stewards for tomorrow. NPT is the only land trust with a comprehensive mission of protecting national parks through land acquisition, and creating a pipeline of future park stewards by getting kids to parks. Since 1983, NPT has completed 66 land projects in 30 states, 1 US Territory, and Washington, DC. This school year NPT will provide an estimated 27,000 kids with park trips through their nationally recognized Buddy Bison School Program and Kids to Parks Day National School Contest, both of which support Title I schools. The Trust for Public Land creates parks and protects land for people, ensuring healthy, livable communities for generations to come. Millions of people live within a 10-minute walk of a Trust for Public Land park, garden, or natural area, and millions more visit these sites every year. Celebrating 50 years, the National Park Foundation is the official charity of America’s national parks and nonprofit partner to the National Park Service. Chartered by Congress in 1967, the National Park Foundation raises private funds to help PROTECT more than 84 million acres of national parks through critical conservation and preservation efforts, CONNECT all Americans with their incomparable natural landscapes, vibrant culture and rich history, and ENGAGE the next generation of park stewards. In 2016, commemorating the National Park Service’s 100th anniversary, the Foundation launched The Centennial Campaign for America’s National Parks, a comprehensive fundraising campaign to strengthen and enhance the future of these national treasures for the next hundred years. On October 22nd I’m celebrating my birthday by getting outside with my friends and planning a party that everyone can join! Parks are the perfect place to host parties. To help you plan your own birthday (or celebrate mine!) I will be sharing some great game ideas this month on social media. Make sure you follow National Park Trust on Facebook and Twitter to get free downloadable content like Pin the Tail on the Buddy. You can also celebrate my birthday by getting your own Buddy Bison. Each little Buddy sale provides one student from a Title I school with a park trip. Our DC Buddy Bison Schools are back to school—and back to parks! We traveled all over the DC, Maryland, and Virginia area exploring and celebrating federal public lands. Don’t forget to take YOUR Buddy on adventures with you this fall too. Use our Park Finder to help you explore outdoors! Neval Thomas Elementary’s 3rd graders visited one of the many national parks in their “backyard,” the National Mall and Memorial Parks (DC). There, they met many rangers who told them the stories of the great people memorialized in downtown Washington, DC. They explored the symbolism at the Thomas Jefferson Memorial and found clues to Franklin Delano Roosevelt’s story at his monument. Then they discovered Lincoln’s place in history and learned their own responsibility to help finish Martin Luther King, Jr’s work. Thanks Pepco for providing volunteers and transportation for this long-time Buddy Bison School! the George Washington & Jefferson National Forest (VA) this month. The students took turns wriggling into wetsuits and joined educators from the US Forest Service in the stream just off the Lion’s Tail Trailhead. While underwater, the students were looking for small fish, crayfish, insects, and plants. Students also participated in a stream survey with educators from NorthBay and the Chevy Chase Audubon Society. Using dip-nets, students caught critters in their nets and identified what species of insects they found. A huge thank you to the US Forest Service for making this aquatic adventure possible. Washington Jesuit Academy journeyed to Antietam National Battlefield with their 8th graders, the site of the bloodiest battle during the Civil War. After touring the battlefield on their own, they met with a ranger who showed them how both Confederate and Union soldiers communicated with each other on the battlefield, as well as the steps required to fire a cannon. The students used a cipher disk and swung flags in simple patterns to send coded messages to each other across a field. Then they learned how the cannons worked. They took turns playing the different roles and raced each other to see who could complete all the steps the fastest. The 8th graders had a great time! Thank you to the A. James & Alice B. Clark Foundation for making this trip possible. Seaton Elementary and their 2nd graders traveled to the US National Arboretum, where they explored the Washington Youth Garden and the “Fern Valley” trail. In the garden, they used all five of their senses to experience the plants that are grown there. They also learned about the importance of pollinators, tasted honey, and observed the decomposers (earthworms) that help turn dead plants back into soil. In Fern Valley, the students saw what their neighborhoods would be like if humans didn’t live there. They saw frogs and turtles. Just like in the garden, they used their five senses to make observations about the plant life on the trail. Let’s give a Buddy Bison shout-out to DecisionPoint for sponsoring this school for another year of adventure! Viewing wildlife can be one of the most exciting moments during any park visit. Buddy Bison Student Ambassador Tigran was on a quest this summer to find a moose at Rocky Mountain National Park. Check out Tigrans blog to see if he was successful! Is there a park you dream of visiting? Talk to your school about applying to the Kids to Parks Day National School Contest! Title I schools can enter and win up to $1,000 to fund a dream park experience. Learn more about the contest, download the entry form, and watch our school video from last year! Questions? Contact Katie Zimmerman, (katie@parktrust.org) or call 301-279-7275. If you would like to help sponsor this program, contact Rebecca Hansell, rebecca@parktrust.org. Last month, I shared the outdoor adventures of some our 2018 Kids to Parks Day School Contest winners. Now, let’s take a dive into the incredible hands-on learning that happens when you step out of the classroom and into your local park! Maybe these experiences can inspire your own contest entry. Photo courtesy of Cody Perry. Craters of the Moon National Monument and Reserve is a maze of lava fields, caves, and sagebrush steppes. Tendoy Elementary’s (ID) 5th graders explored the unique volcanic geology of this national park unit by hiking and enjoying ranger-led hands-on experiments. They saw firsthand how volcanoes can explode by making a “rocket” out of Alka-seltzer and vinegar! Photo courtesy of Meghan Hess Shamdasani. Have you ever thought about being a scientist? 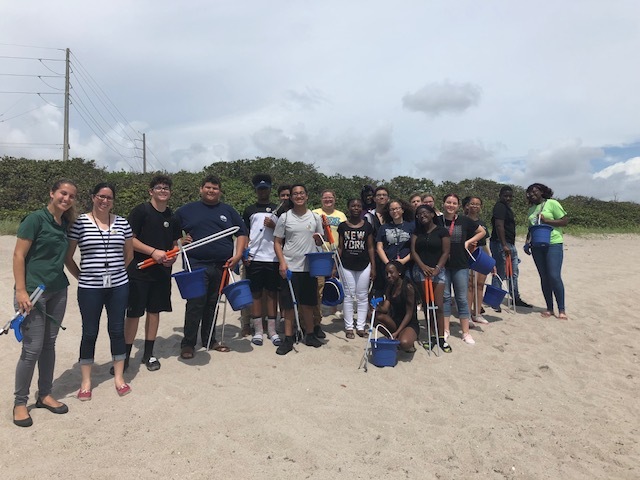 SouthTech Academy’s (FL) high schoolers did a large project investigating the impact of plastic waste on their local seashore. They researched the different kinds of plastics in the oceans and participated in a class survey studying which straw people would choose once they knew its environmental effect. Then they traveled to Juno Beach and picked up trash along the shore. They discovered that what they learned in class is correct in real life! Afterwards, the students toured the Loggerhead Marinelife Center and saw the sea life that can be affected by trash in the ocean. All of the kids went home with a greater sense of what they can do to help. Photo courtesy of Krista Gordon. At the park, the students observed how different types of soil and rock can filter pollutants. They also discovered creatures that live in tidal pools in the park. Finally, they hiked to the 19th-century lime kiln that gave the park its name. Cozier ES even spotted the orca pod they’d adopted! The 25th Annual Public Lands Day is coming to a park near you on September 22, 2018! For the last several years, I’ve celebrated the National Environmental Education Foundation’s Public Lands Day along with National Park Trust, National Park Service, U.S. Forest Service, and too many other partners to count! National Public Lands Day (NPLD) is the nation’s largest, single-day volunteer effort for public lands. Many federal public lands like national parks are FREE to enter on this day. Find an NPLD event [insert link] or use NPT’s Park Finder map [insert link] to find a great National Park Service site near you. Visit a national park for free. Volunteer and receive a fee-free day coupon to be used on a future date. Find participating parks. Share your favorite outdoor activity on social media channel with the hashtag #NPSVolunteer, #FindYourPark and #NPLD. Don’t forget to tag #BuddyBison too! Can’t make it to a park on September 22nd? You can have a “distance learning adventure” instead! Go to FSNatureLIVE.org to go caving, visit an American rainforest, or meet bats up close. #BatWeek is coming up soon too, October 24-31. Learn more at their website. How will you spend National Public Lands Day this year? Let us know by tagging us on social media with a picture of you and Buddy enjoying the outdoors: #BuddyBison #WheresBuddyBisonBeen. Buddy Bison Student Ambassador Bryan created a handy list of “Tips for Road Trips” to help you plan your next park adventure. Junior Ranger Bryan has traveled all around the East Coast, Midwest, and even in Canada to explore the outdoors and wants to help you make your next road trip with kids successful!